The product assures exquisitely made coffee enriched by the traditional brew essentially embedded in the cultural attributes.Marshall – Fowler offers wide range of roasters with varying capacities to cater to the needs of small and large scale coffee powder manufacturers. Marshall – Fowler offers wide range of roasters with varying capacities to cater to the needs of small and large scale coffee powder manufacturers. 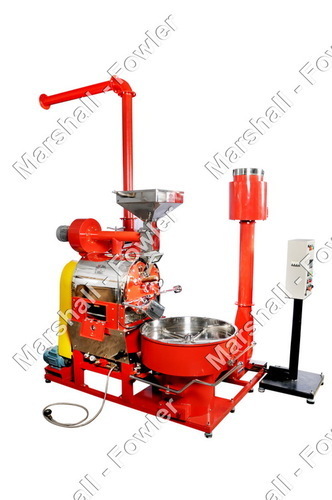 Since our inception in the year 2003, we, Marshall Fowler Engineers India (P) Ltd. have gained immense expertise in the domain of distribution of a wide range of Tea, Coffee, Maize, Coconut Processing Machines and Conveyors. These machines find their major application in the use at industries indulged in the process of manufacturing coffee as well as tea and other products. Our vendors have fabricated this range as per the international standards of the industry that makes it highly applicable for quality processes. Each of the machine has a major segregated process and are used in vivid kinds of applications of preparation of beans to fine coffee powder. Highly reckoned in the industry, our vendor base has been widely indulged in to the process of manufacturing these machines to ease the process. Our clients have always been satisfied of the quality that we provide them and have been in a consistent demand of these coffee and tea processing machines. We distribute this machine range to our industrial patrons on the most competitive prices. These machines are of the best in compositions and have so far won the trust our clients in the most apt manners. We export our products in East Asia, Middle East, Indian Subcontinent, South / West Africa, North Africa, Australia / NZ, Caribbean, North America, South America and Central America.